Renowned for their elegant natural and pure wool carpets, Kersaint Cobb pride themselves on offering a savvy style for everybody. Kersaint Cobbs raw materials have been sourced from all across the globe, such as the premium Wools of New Zealand and the enduring Seagrass from the coasts of Asia which are all manufactured to the highest quality giving you the customer a floor-covering that will last for years to come. As well as the Wool and Natural Flooring options, Kersaint Cobb also offer stunning Striped Stair Runners within their Morocco range which are Pre-finished and 100% Sisal making them incredibly hard wearing giving you a super stylish alternative for your stairs. Wool- Beach Hut Stripe, Cascade, Pampas Berber Loop, Silk Touch and Vogue. Sisal- Big Boucle, Herringbone, Linen, Panama and Tigers Eye. Seagrass- Basketweave, Fine Herribngone and Fine Standard. Jute- Medium Boucle and Panama. Coir- Boucle Natural, Herringbone Natural and Panama Natural. Morocco Runners- Casablanca, Fez, Nador, Safi, Taza and Tetouan. 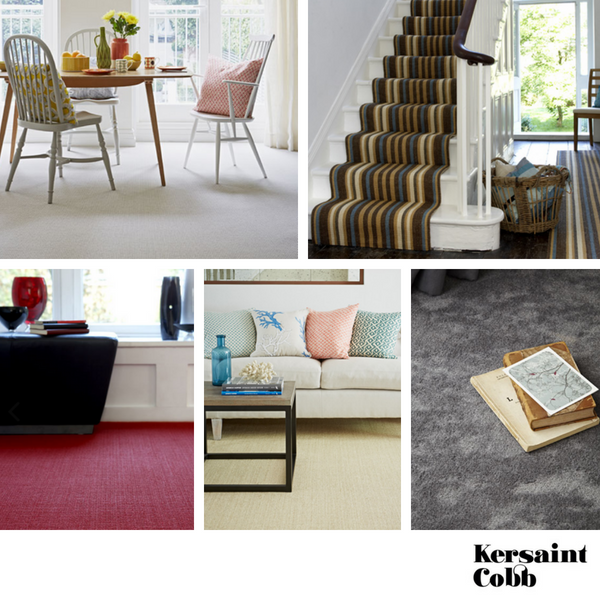 To see the all the fantastic products available from Kersaint Cobb, please call into our Heaton Moor showroom to see what all the fuss is about.